This looks simply amazing! I love figs. This was definitely a must-pin! Thanks, Judy! I still haven't figured out all this "pinning" business, but I'm working on it. Thanks, Laura! And it's so easy - fits right into "the simple life." The cake does look wonderful!! I just found my love figs this year, if you can believe that! Jenn, thanks! Glad you found the love this year! 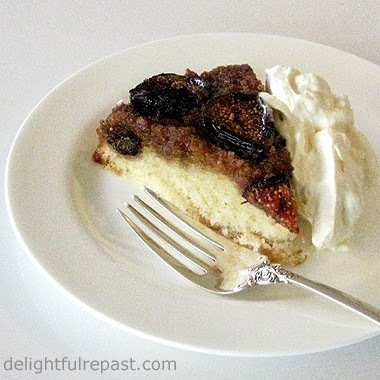 Only someone who can spell discombu…discumbo…dis – that word – could possibly invent the fig upside down cake. (And I thought Newton invented all that fig stuff.) Anyway, I’m not sure I can swallow upside down, so I’ll just admire the picture. There is something biological about those sectioned figs. They should be in an anatomy book. I’m thinking you should extend your food processing to animal husbandry and all the rest of it, i.e. raise, package and prepare, taking photos all along the way. You could be the Audubon of the abattoir with your images. OK, I’ll stop. But don’t you stop. Another great article, and a step forward in your journalistic odyssey. 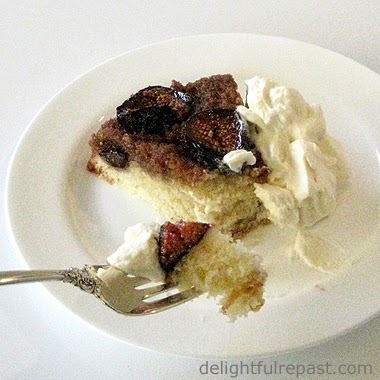 A wonderful fig cake, Jean. We love figs, my husband said that fig tastes almost as good as his favourite fruit banana. Thanks, Joanne! I once read somewhere that a fig isn't, technically, a fruit but rather a flower turned in on itself. Sully, I'm the last person you'd want in the abattoir - I'm quite squeamish about, shall we say, non-vegetable foods! Newton, eh? Now you've got me ready to run down to the natural foods store to pick up a package of Fig Newmans. Angie, thank you. Though I've never grouped figs in with bananas, they do have some qualities in common - very sweet and mellow and *something* about the texture. Ooh, I bet the figs tasted great! They sure did, yummychunklet! Hope I can get some more soon. Thank you, Mary Frances! And I'll check out that clafoutis - hope I can get some more figs soon! Jean, the first home I purchased had a mature fig tree. I sure wish I had this recipe then. You have a lovely cake here! Brooks, thank you - that's such a compliment coming from THE cake man!